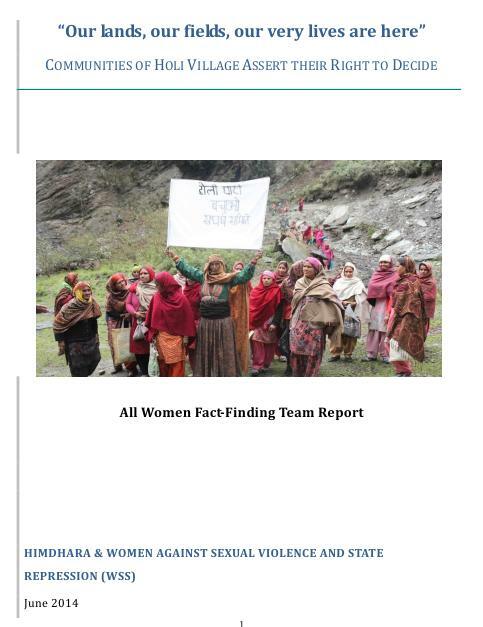 In response to disturbing information circulated on our mailing lists about the eviction of a long-standing settlement in Dharamshala, WSS (Women Against Sexual Violence and State Repression) and Delhi Forum took the decision to field a joint fact-finding mission; with the objective of investigating the situation, ascertaining if violations of law and human rights had taken place and exploring the possibilities for resettlement and rehabilitation of the community. Read the final report here and annexures here. On March 25, 2014, 31 women from a nondescript remote village in Chamba, Himachal Pradesh were arrested for protesting against the starting of the work of the 180MW Bajoli Holi Power Project. The opposition to the GMR project is almost 2 years old, but in recent past the situation in the area has become sensitive as Police-on-demand have been stationed to assist the company in carrying out their construction activities by addressing any ‘law and order’ situation. While the women were released on bail the next day, a series of cases were filed against them including promoting enmity between different groups on grounds of religion, race, place of birth, residence, language, doing acts prejudicial to maintenance of harmony, voluntarily causing hurt to deter a public servant from his duty, rioting, unlawful assembly, wrongful restraint, intentional insult with intent to provoke breach of peace, criminal intimidation and using criminal force to commit theft. Despite this, the women continued their 24 hour agitation at the project site. Since then, several incidents of threat and intimidation have occurred, with the local contractors, politicians as well as the District Administration exercising pressure for the women to call off their protest. In this situation, in April 2014, as groups concerned for the issues being raised by the women and in support of their democratic rights, an independent all women’s fact finding team visited the area and interacted with the local women and men. This document attempts to trace the history and background of the agitation and examine the demands being raised by the communities living in the affected villages. The fact-finding team also shares its observations of the situation on the ground.